Aline was initially designed to be a trilingual UTAUloid, speaking Japanese, English and Brazilian Portuguese, but English and Portuguese voicebanks couldn't be completed, thus, making her a Japanese-only VB. Her voice is regarded as unique, mainly because of its boyish tone and her strong Brazilian-Portuguese accent. It is highly recommendable to use fresamp the settings H0F-15BRE0MOD0 (as well as tweak some flags in some individual phonemes) when using her v1. m4 is also recommended, if you are a beta-tester, but the BRE0, MOD0 and individual flag settings still apply. Best results with Aline v2 are obtained by using TIPS, resampler.exe, m4, tn_fnds, EFB-GT/EFB-PB/WARP and moresampler (all of them while using BRE0 and MOD0). m4 isn't publicly available. 1. The author gives full permission to use Aline Enbukyoku's images, character design, personality and voice in any kind of works as desired by the one depicting it, as long as it follows UTAU rules of usage and proper credit is given, which means that no political/economical/religious propaganda are allowed, nor depictions of racism, homophobia or any other type of direct offense/bullying to the author, third parties or groups. Classical religious hymns and country anthems should be fine, as long as it respects said religions/countries laws and dogmas; if said religion/country does not allow for voice synthesizers to sing their hymns/anthems, Aline shall not be used for these songs. 2. R-18 and R-18G songs, stories and pictures are allowed, as long as they comply with the rule above. If they are tastefully done or not, it doesn't hold importance; you are free in that sense. See point 9 for working with duets and groups in this respect. 3. The author also gives permission to disregard or modify character design, personality and history as you seem fit; but the voicebank in itself must be acknowledged, if said changes are too drastic. 4. Please do not claim Aline Enbukyoku as your creation. She is property of Aline M. de Oliveira and sampled with her own personal and inalienable voice. Failing on comply this rule might upset the author and make her remove both her works and Aline's voicebank from the internet. New designs, history and personality that are given to her by others may be claimed as theirs and are free of restrictions on property. 5. You may call the character as either Aline Enbukyoku, Enbukyoku Aline, Aline Martins Briggs, Aline Briggs, 円舞曲アリーネ, アリーネ・マルティンス・ブリッグス, アリーネ・ブリッグス, or anything as desired. But any name besides Aline Enbukyoku, Enbukyoku Aline and 円舞曲アリーネ must have a warning about the actual voicebank name, which is recognized by either of these three; it's also not allowed to claim her as other UTAUloids or Vocaloids, nor as your own character, as already stated in the previous rule. 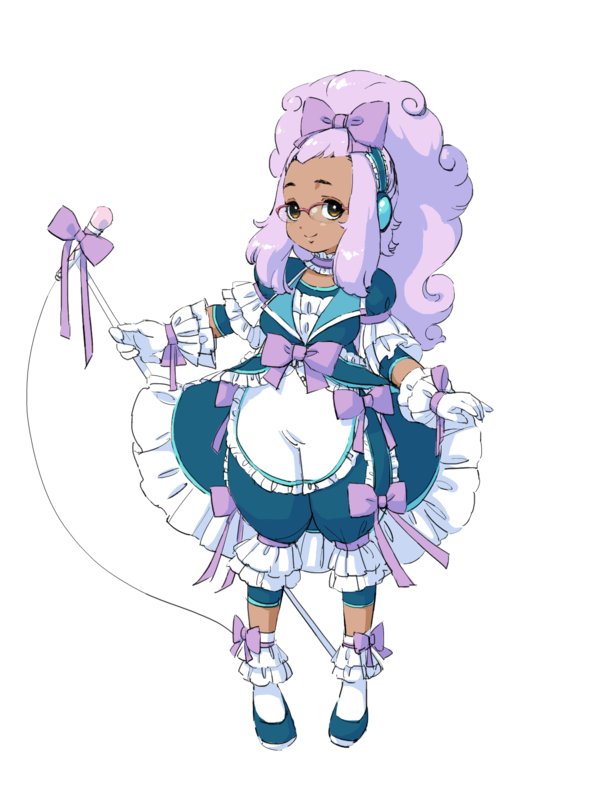 It is allowed for her to voice another original character, though, as long as acknowledgement on the original voicebank is given. 6. Aline can be rendered for personal use, but commercial use is restricted; the only exceptions are for charity/donation, equipment maintenance or "donationware" payments; profit-based songs must have written permission from the voicebank author. This is done to avoid copyrighting a voicebank that's not yours. Although, if the user makes a song for profitting and wants to share the gains with Ameya/Ayame (in case it's rendered within UTAU), it is freely allowed. In case of commercial use of her image, the same rules apply; you may consult the voicebank author for profit use, though. Any works that share profits with Ameya/Ayame can be considered as a donation and are allowed. It's also recommended to register your work with a Creative Commons license, to allow remixes and covers by other users. 7. Aline can be freely converted into a GarageBand plugin, but only if said plugin is free to redistribute and free of charge. Charging for it is claiming her voicebank as your own, which is completely forbidden. 8. Aline can be edited and redistributed as much as you want, as long as the original voicebank and author are clearly acknowledged and it is still kept as a free voicebank. 9. She can be paired/grouped with whoever UTAUloid/VOCALOID you want to, as long as it respects what the VOCALOID(s)/ other UTAUloid(s) creator(s) specified in their own rules. 11. This voicebank complies with the Creative Commons Share Alike (CC BY-SA) license. Any modifications to the voicebank or its derivative works are to be shared in the same way the original works are. Likes: Chocolate, sweet foods, anime/manga, BL, pretty/geeky guys, glasses, being chubby, Gakupo, internet, waltzes, bossa nova, Canada. Dislikes: Sports (except martial arts), rude or dumb people, "fat" being used as insult, being asked about intimacy, womanizers/players, cars (due to her accident), pedophiles, cigarettes. Race: Mixed ethnics (human)/cyborg (which means that she's a human with mechanical parts). Catchphrase: "I'm good at throwing bricks, better not taunt me." Hair color: dark purple (like an eggplant's; initially unintentional, but may be used as joke fodder). Headgear: Lilac visor, which is actually a customized pair of glasses for Astigmatism. 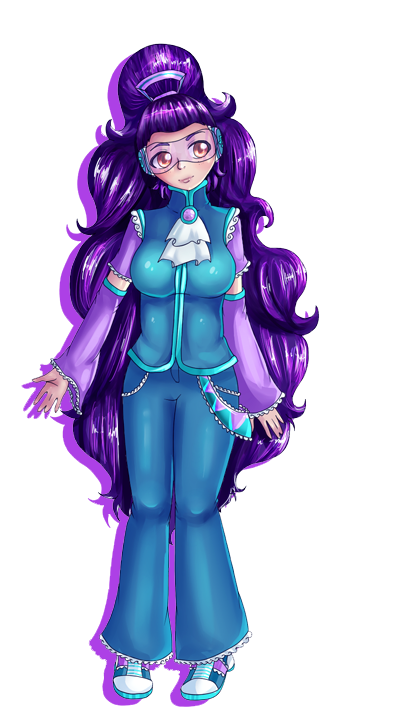 When not using the visor, she just uses regular glasses (or glasses with either a lilac, blue or teal tint to it when she's feeling fancy). Eye color: Sorta brick-colored, but darker (a reddish brown). Earphones: Blue headset with white and purple trims and teal musical notes on the earphones (which can glow or not, depending on how broken Aline is to save on batteries); said earphones might come with microphone plugs, as she probably managed to always break the portable microphones the headsets possessed before. She possesses three sets of earphones in case of breaking, which might occur pretty easily. Clothing: Lilac shirt with small frills on all extremities (said shirt can be tucked or untucked, depending on her mood), blue vest with teal extremities and frills on the shoulders, white attachable jabot with teal-trimmed purple jewel (which she sometimes may forget to attach and tie the cloth), blue pants with small frills on pockets and leg ends, purple and teal belts with small frills on the sides, lilac arm warmers with teal trims on the elbows and frills on wrists, blue sneakers with teal soles and ties and purple frilled side details, small lilac socks with frills on the extremities. See Reference Picture for details. Aline was kicked out of her house for being a slacker and was searching for a job; she ended up working with a mad scientist as an intern, living with him and being paid in chocolatey treats. One day, he wanted to conduct an experiment involving a new type of car fuel, and she offered help… But in the end, the experience failed and he had to patch her up as a cyborg, just because cheap and good handwork was, according to himself, "difficult to find these days". Usually with a fake and cold polite smile and behavior to those she doesn't know, but cuddly or a bit motherly to those she likes. Can be either too cynical or too naive, depending on the situation. May use a boyish way of speaking, but is polite and mostly doesn't swear (except for a "damn" or two sometimes). Might be regarded by others as "eccentric", due to her quirks and behavior. Has unexpected reactions while trying to express romantic love, much to her boyfriend's chagrin. - She, like her creator, is left-handed. - Her character design was inspired in Corrector Yui, and her color scheme is similar to Kamui Gakupo's (which wasn't on purpose at first). - She claims to possess quite a number of scars below her unrevealing clothes; some from the lab accident, some from the cyborg operations; It's unknown how they are or if they even exist, since she doesn't like revealing clothes, nor the beach. It may be a ruse to gain sympathy or to invent an excuse to dress in a discreet manner. - Aline may be very accident-prone. She might have the tendency to always suffer injuries for the weirdest reasons. Character Details, traits and backstory is entirely optional, feel free to portray them as you like.